Perhaps it’s one of Singaporeans’ biggest pity that durians aren’t in season all year round. Sure enough, there might be durian cafes to help tide us through, but more often than not the prices are far from wallet-friendly. 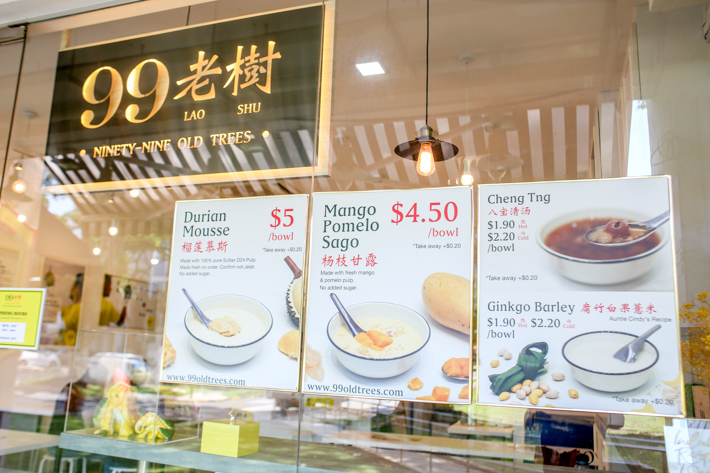 99 Old Trees, known for their farm-to-table durians and durian delivery service, have now crafted the most decadent Durian Mousse to give you nothing but the best during the durian off-peak season. 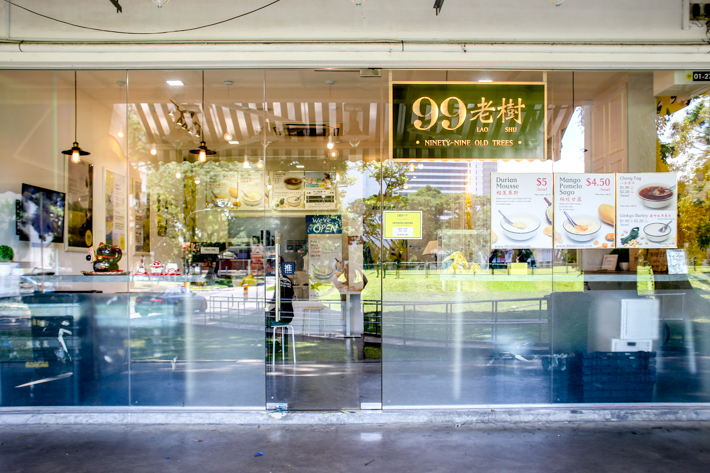 They’ve opened up at Farrer Park, taking over the former premise of Shiberty Bakes and now specialise in Cantonese-style desserts. Unlike your usual roadside durian cart stall with crates and crates of durians, 99 Old Trees has a cafe-like quality to it, with a clean interior filled with quirky humorous posters and decorations everywhere. And unlike your usual cafe, the prices are far from exorbitant, and the food far from overly dressed up. We ordered their signature item, Durian Mousse (S$5), as well as their Mango Pomelo Sago (S$4.50) and a hot Cheng Tng (S$1.90). Their Durian Mousse was nothing like the typical durian-flavoured paste commonly served at other dessert joints. Made fresh upon order using the flesh of a D24 durian, the blended mousse is incredibly rich, tasting very much like if durian was a drink. Seemingly lacklustre in appearance, the creamy and smooth mousse hides a surprise right at the bottom. Dig a little deeper and you’ll find durian flesh scrapped off its seed that enhances the taste and texture of the mousse. It wasn’t too heavy, and perhaps can be considered one of the best durian desserts out there. Serving as a lighter tasting counterpart and an alternative for durian nay-sayers, the Mango Pomelo Sago was a treat in itself too. It boasts a satisfying mix of icy and creamy goodness without being too heavy. The taste of the mango is prominent throughout the cream, with little pops of zing and bitterness from the pomelo bits that cut through the fresh cubes of mango, all of which was contrasted with the texture of the sago balls. For a bit of a refresher and also to cleanse our otherwise heavy palates, the Cheng Tng was perhaps one of the most comforting desserts there. The soup was light with the flavours of longan and white fungus being rather prominent. It’s a lot less sweet than the ones normally found in hawker centres, this had a much more well-rounded flavour, and we’d think that the elderly would appreciate this more than the usual garden variety. A hidden gem in a sleepy estate, 99 Old Trees is definitely worth travelling for. They’ve cleverly made use of whatever ingredients they have available to them and executed delicious Cantonese-style desserts that cater to both a younger crowd and the older folks in the area. You’ve definitely got to try their desserts for yourself.